No matter how independent, self-sufficient, or even self-employed you are, you now have a boss. In other words, you’ve probably discovered your phone telling you what to do. 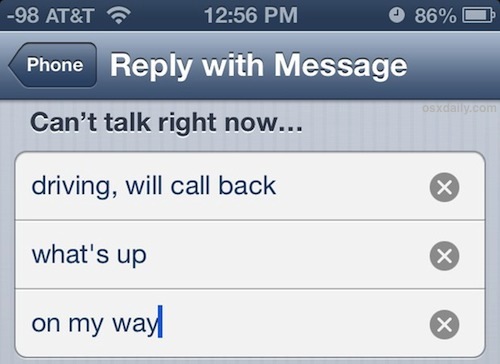 May the day never come when I use this option. It’s so incredibly impersonal, and so obviously machine-generated. Or worse, there’s Facebook, which on our business page feels the need to inform me that I “haven’t responded” to something which clearly needs no reply, and if I don’t it will affect our “response rating.” If we know the customer well, I will tell them why I needed to make one more response and ask them not to reply to it. Social media is supposed to be helpful, not obnoxious. Instead, it makes me seem like some boorish person who has to have the last word. The problem is that now that we know what a machine made response looks like, on the sending end of the equation, we have to go out of our way not to do anything which might be construed as equally impersonal. On the receiving end, it makes us more cynical. I got a response this week from someone who I’d sent a particular link to a 3-minute video clip. While I lean toward the notion that he did indeed watch it, the response could have been equally written by someone who wanted to be cordial but decided to pass. There wasn’t the specific response I was looking for. Perhaps we’re all just starting to talk like our devices. The pattern of communication has been disrupted, sort-circuited, rewired. I’m told we don’t always pray specifically, either. That sometimes God doesn’t answer because we haven’t really asked for anything specific. The argument continues that we wouldn’t know the answer if we got it because we really didn’t delineate what we were hoping to happen. Additionally, if you decide to comment on this blog post, you’ll see that my comment section begins, “Value-added comments only.” I’m expecting people to want to continue the discussion. If you say, “That was good;” I probably won’t run it. I guess I’m looking for substance. Thanks. It was exactly the material we were looking for. I got the attachment and am hoping open it tonight when I have more time. I will do this, but you may not hear back until Monday. It’s communication. Something we do. Something that separates us from the animals.